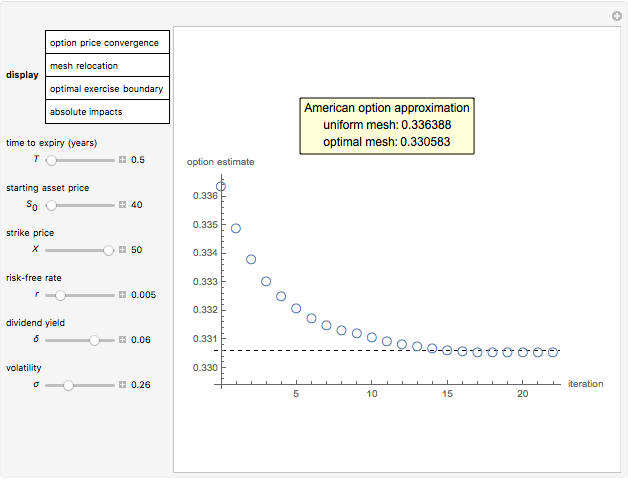 This Demonstration shows an adaptive mesh relocation-refinement (AMrR or sometimes AMR) strategy on Kim's method  for pricing American options, using the composite trapezoidal rule over a time mesh with four steps. A European financial option is an instrument that allows its holder the right to buy or sell an equity at a future maturity date for a fixed price called the "strike price." An American option allows its holder to exercise the contract at any time up to the maturity date, and because of this, it is worth more than the European option by an amount called the "early exercise premium." For the American call's holder, the early exercise becomes optimal when the underlying asset price exceeds a critical boundary , above which the intrinsic value of the option becomes greater than its holding value. According to Kim's method, the valuation of the American option derives from an integral expression of the early exercise premium as a function of the optimal exercise boundary plus the value of the European option. An adaptive mesh usually aims to control the size and the shape of each element so that for any particular solution, the overall error is controlled (Budd, Huang and Russel, 2009). There are numerous applications of mesh adaptivity, including computational fluid dynamics, groundwater flow, blow-up problems, chemotaxis systems, reaction-diffusion systems, the nonlinear Schrodinger equation, phase-change problems, shear layer calculations, gas dynamics, magneto-hydrodynamics, meteorological problems and others. In mathematical finance, adaptation strategies (e.g. [2, 3]) have been applied to optimize the mesh of space-time finite element approximations of the Black–Scholes model. This Demonstration tests a similar AMrR strategy on Kim's method, which relies on a recursive process to approximate the critical boundary in conjunction with the composite trapezoidal rule. The r-adaptation strategy aims to minimize an adjoint functional that is assumed to be linearly related to the global error; practically, the r-adaptive algorithm maps the sensitivity of the solution to locally refined regions and generates weights to resize the time steps accordingly. This process is repeated until the sensitivity of the solution is distributed equally over the time steps. This AMrR algorithm is inspired by the methods in [4–6]. The optimal mesh not only produces more accurate option price approximations compared with the uniform mesh, but also can generate tighter upper bounds for the theoretical option price, combined with the upper bound methods in [7, 8]. 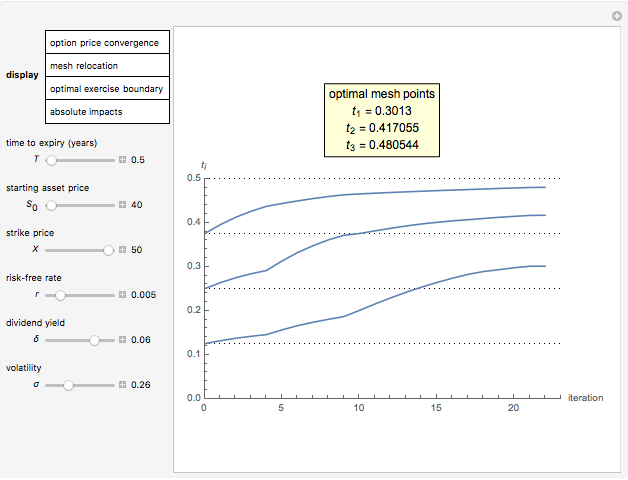 "option price convergence" shows the American option price convergence through the mesh refinement process. The table shows the option price approximation according to the uniform and the optimal mesh, respectively. "mesh relocation" shows the adaptive mesh resizing through the refinement iterations. The horizontal dotted grid lines indicate the uniform mesh mapping. The table shows the temporal points at their optimal position. "optimal exercise boundary" shows the approximation of the optimal exercise boundary obtained from the refined mesh, compared with the boundary obtained from the uniform mesh. 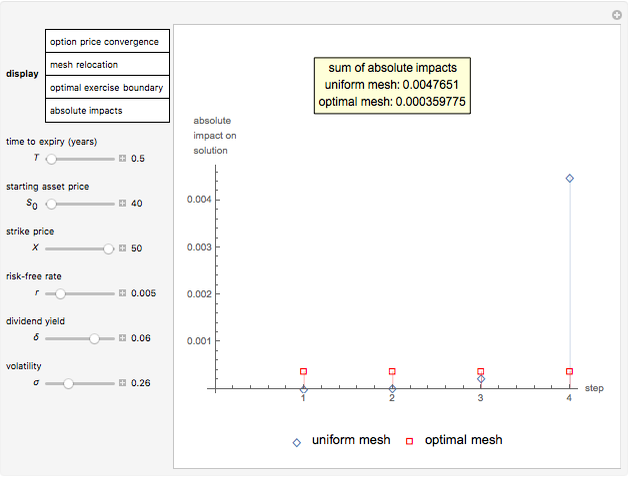 "absolute impacts" shows the distribution of the solution sensitivity obtained from the refined mesh, compared with the respective distribution obtained from the uniform mesh. The table shows the adjoint functional values, respectively. The value of the American call option is then given by . Subject to the value matching condition, the critical asset price at time can be numerically approximated by a computationally intensive recursive procedure. This method requires solving integral equations, where is the number of time steps. Each time the integral equation is solved, either the trapezoidal rule (Wolfram MathWorld) or Simpson's rule (Wolfram MathWorld) can be employed to approximate the integral. : an invertible mesh function that maps the arbitrary set in the computational space , to a set in the physical time domain , where and . : an invertible mesh function that maps the arbitrary set to a set , . : a scalar function that uses Kim's method to approximate the American call value at , over the mesh mapping function . : the theoretical value of the American call at . : the impact of the element's local refinement on the solution. Every element's impact on the solution is evaluated as it gets divided into two equal subintervals, while all other elements remain unchanged. : the absolute impact of the element's local refinement on the solution. A small positive real is added to ensure that . : the adjoint functional derives as the sum of absolute impacts and serves as the dual-objective quantity under minimization. where is a restrictive parameter that controls the variability in , and is the iteration index (this Demonstration uses , and ). Through every iteration, all mesh points are relocated simultaneously; the new position of the temporal point is obtained by , where is an adjusting coefficient to ensure that . The refinement process is terminated when or . I. J. Kim, "The Analytic Valuation of American Options," The Review of Financial Studies, 3(4), 1990 pp. 547–572. www.jstor.org/stable/2962115. A. Ern, S. Villeneuve and A. Zanette, "Adaptive Finite Element Methods for Local Volatility European Option Pricing," International Journal of Theoretical and Applied Finance, 7(6), 2004 pp. 659–684. doi:10.1142/S0219024904002669. C. Goll, R. Rannacher and W. Wollner, "The Damped Crank–Nicolson Time-Marching Scheme for the Adaptive Solution of the Black–Scholes Equation," Journal of Computational Finance, 18(4), 2015 pp. 1–37. doi:10.21314/JCF.2015.301. J. T. Oden and S. Prudhomme, "Goal-Oriented Error Estimation and Adaptivity for the Finite Element Method," Computers and Mathematics with Applications, 41(5–6), 2001 pp. 735–756. doi:10.1016/S0898-1221(00)00317-5. K. G. van der Zee, E. H. van Brummelen and R. de Borst, "Goal-Oriented Error Estimation and Adaptivity for Free-Boundary Problems: The Domain-Map Linearization Approach," SIAM Journal on Scientific Computing, 32(2), 2010 pp. 1064–1092. doi:10.1137/080741227. P. Luchini, F. Giannetti and V. Citro, "Error Sensitivity to Refinement: A Criterion for Optimal Grid Adaptation," Theoretical and Computational Fluid Dynamics, 2016. doi:10.1007/s00162-016-0413-x. M. Broadie and J. Detemple, "American Option Valuation: New Bounds, Approximations, and a Comparison of Existing Methods," The Review of Financial Studies, 9(4), 1996 pp. 1211–1250. doi:10.1093/rfs/9.4.1211. S.-L. Chung, M.-W. Hung, and J.-Y. Wang, "Tight Bounds on American Option Prices," Journal of Banking and Finance, 34(1), 2010 pp. 77–89. doi:10.1016/j.jbankfin.2009.07.004. Michail Bozoudis "Adaptive Mesh Relocation-Refinement (AMrR) on Kim's Method for Options Pricing"